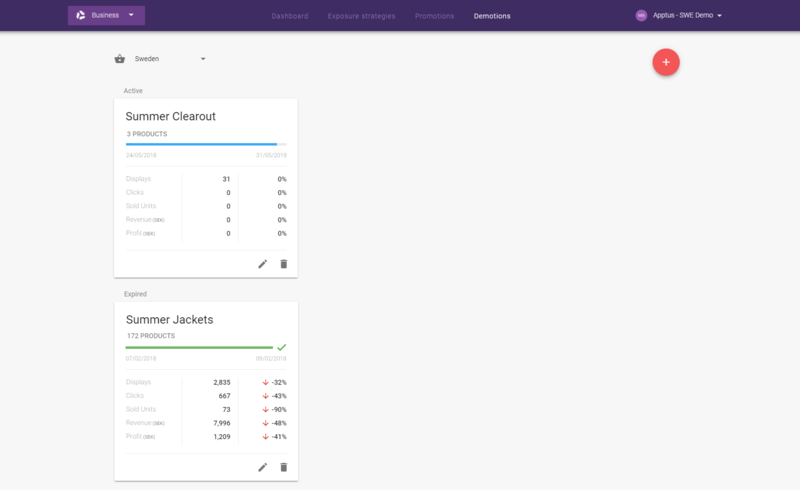 The Business app enables a merchandiser to control exposure strategies, promote products, and perform A/B-tests with just a few clicks. 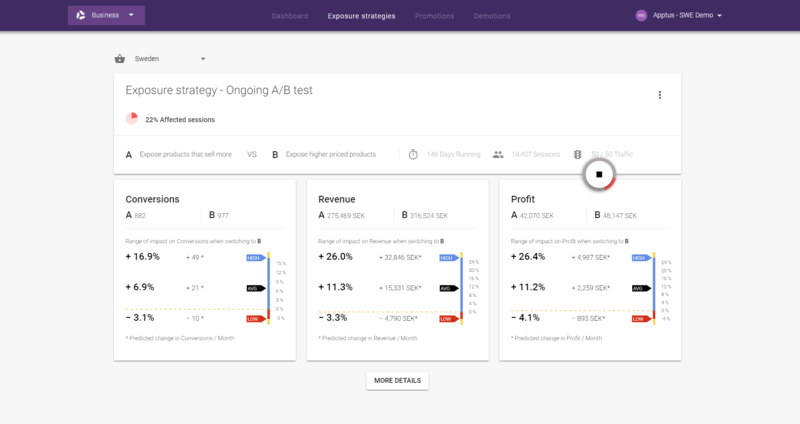 It also allows for panel performance reports and quick insights into sales origins for a market segmented on conversions, revenue, and profit. App design and features are subject to change without notice. Screenshots, including simulated data visible, are for illustrative purposes only. 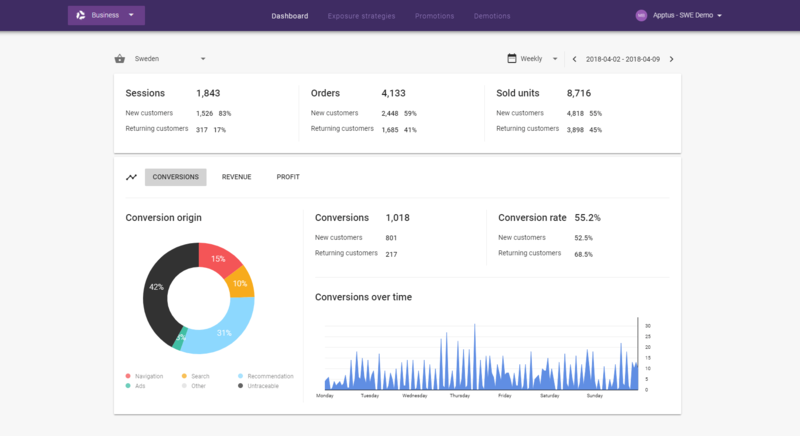 The Business app dashboard gives quick access to metrics such as sessions, orders, and sold units. It includes graphs for conversions, revenue, and profit as well as the origins of those metrics. The data on the dashboard is displayed per market over a period of time that can be either daily, weekly, monthly, or a custom interval. Sessions The number of active visitor sessions during the set period of time. Orders The number of orders that have been completed and notified with Payment Notification (Web API v1, Web API v2) or Secure Payment Notification (Web API v1, Web API v2) during the set period of time. An order can include one or more products. Sold units The number of sold products in the orders during the set period of time. Conversions The number of sessions where at least one order have been completed and notified with Payment Notification (Web API v1, Web API v2) or Secure Payment Notification (Web API v1, Web API v2) during the set period of time. Revenue The revenue of the sold products during the set period of time. Revenue can only be calculated when using Payment Notification (Web API v1, Web API v2) or Secure Payment Notification (Web API v1, Web API v2), and including the parameter sellingPrice in the notification. Profit The profit of the sold products during the set period of time. Profit can only be calculated when using Secure Payment Notification (Web API v1, Web API v2), and including the parameters sellingPrice and cost in the notification. The origin of a purchase is determined by the first interaction a visitor have with the purchased product. The origins grouped by Navigation, Search, Recommendations, Ads, Other, and Untraceable. The interactions are tracked with the use of Notifications. If a product is purchased through a search result (Search), but the first interaction was a click on the product on a category page (Navigation), the purchase origin will be attributed to Navigation. The conversion, as well as all the revenue and profit of that purchase, will be attributed to Navigation. A conversion can include multiple products, hence one conversion can originate from more than one place. Other All other eSales panels including Abandoned carts panel, Recently viewed panel, Those who viewed also viewed panel, etc. Untraceable Sales that can't be traced to any eSales panel. Exposure strategies is a concept that enables merchandisers to have Apptus eSales optimise its algorithms for product exposure towards different business goals. Three different exposure strategies are available, and A/B testing can be performed between two strategies. Exposure strategies include a step-by-step guide on how to set up and get started with testing. Before selecting an exposure strategy it is recommended to perform an A/B test between the strategies. An A/B test will establish the effect of switching exposure strategy on a site. The site traffic is split into 2 equal groups, each facing one of the evaluated strategies. Approximately 10,000 sessions is needed before any data is visible. Dependent on site traffic, this takes between a few hours and a few days. Promotions is a method to temporarily increase the strategy score of selected products in a market. It is useful for use cases such as promoting upcoming external campaigns, stock clearance of specific products, or promoting certain brands or type of products. Promoted products will gain positions in search results, category pages, and other locations where promotions are supported. Products are either handpicked or selected by rules that include or exclude products based on their attributes and values. Statistics for promotions are collected and can be measured against sessions not using the promotions. Demotions is a method to temporarily decrease the strategy score of selected products in a market. It is useful for use cases such as demotion of seasonal products when their season ends, or demoting certain brands or type of products. Demoted products will suppress positions in search results, category pages, and other locations where demotions are supported. Products are either handpicked or selected by rules that include or exclude products based on their attributes and values. Statistics for demotions are collected and can be measured against sessions not using the demotions. 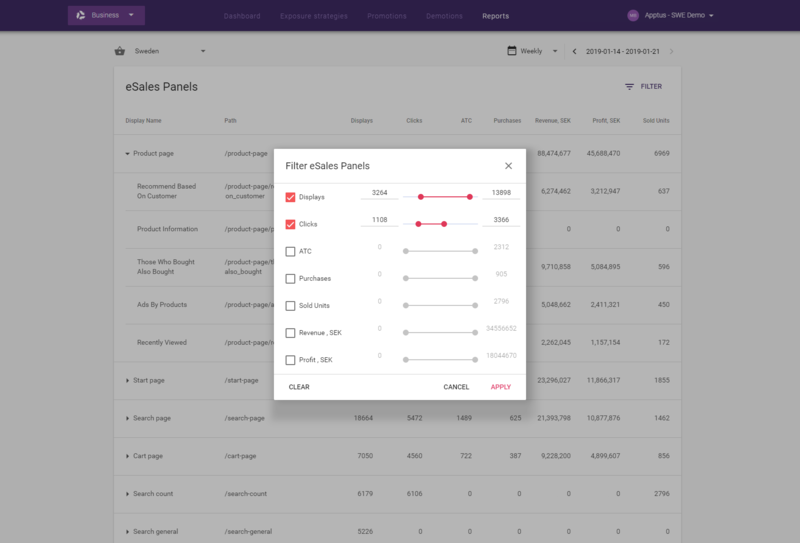 The Reports tab display a list of all pages, zones, and panels configured in eSales and their performance statistics in a market. 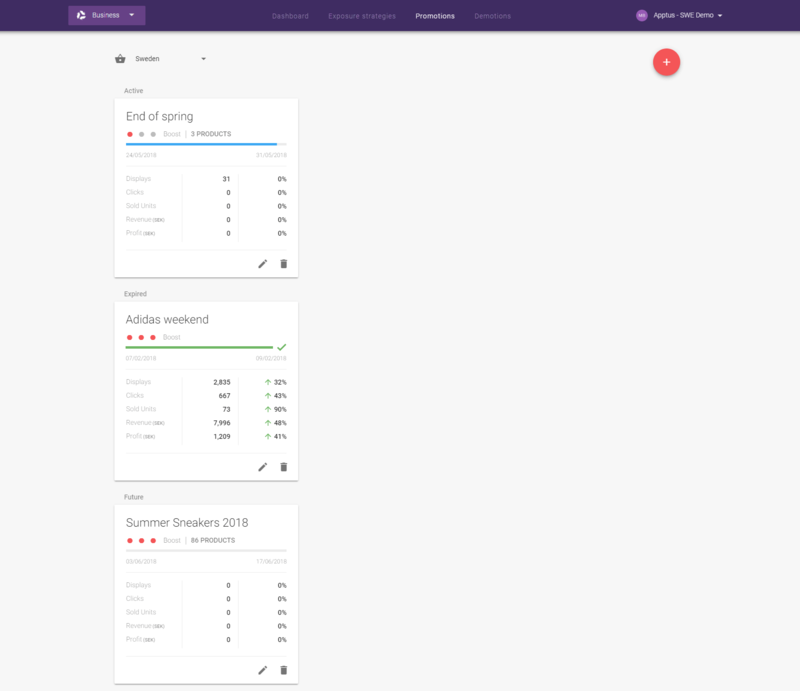 This can be used to see how well a page type or a specific panel performs on the site. If a page or a panel is not performing well this is an indication that a change of the panel or the page can be needed. Each page and zone can be expanded to show the individual panels and their paths and statistics. The following statistics are available. Displays The number of displays of the page, zone, or panel on the site. Clicks The number of clicks on products on a page, zone, or panel. ATC Add to cart, the number of times products has been placed in a cart from the page, zone, or panel. Purchases The number of purchases generated from the page, zone, or panel. Revenue Total revenue generated from the page, zone, or panel. Profit Total profit generated from the for the page, zone, or panel. Requires notification on product cost. Sold units Total number of sold units for the page, zone, or panel. 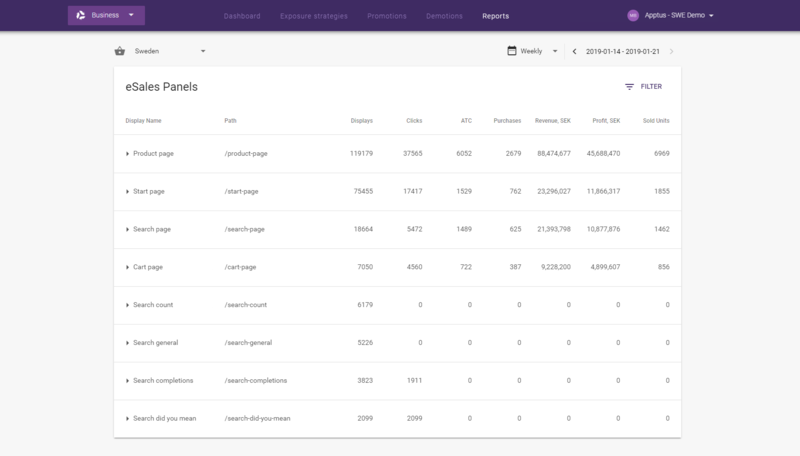 Pages, zones, and panels can be both sorted and filtered based on the statistics.